Lombardi’s Pizza is a pizza parlor in Manhattan, New York. 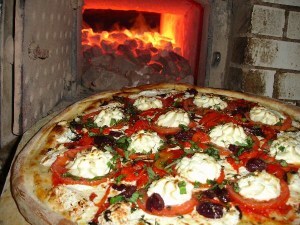 It is known for its range of coal-fired, thin crust pizzas with fresh toppings and quick service. The restaurant has been in existence for the past 107 years, when an Italian immigrant reinvented his staple food, the pizza, to make it the most popular and highly enjoyed food. It is a celebrity hangout, and has already been featured in “The History Channel” and “The Food Network.” Diners love to eat out in the backyard garden of what is generally claimed to be one of the finest restaurants of the five boroughs of New York. Here’s where one can enjoy local favourites and Italian pizzas and pasta, though people often flock here to eat its clam pizza and clam pie. Location: 32 Spring Street, New York, NY 10012. Opening times: 11:30 a.m. –11 p.m. (Sunday-Thursday) and 11:30 a.m.-midnight (Friday-Saturday). Price level (only one course): £12.7-£21.3/$20-30 for pizza. Price level (2 courses & drink): £24/$37.45. It is uniquely tasty because of its thin crust pizza with fresh toppings. Lombardi’s is home for thin brick-oven pizzas in NYC. Any of their thin pizzas and clam pie. A few alternative cheap restaurants will be listed within short.